At check in, you will be assigned a color bandana – this is the colored ship you will be assigned to and which pirate you will root for. We were cheering for the Red Pirate. After check in, you are guided through the new entrance for a group photo behind a ship steering wheel. (Tip: You will be offered the photograph in a frame for $20). Once seated, our server asked us which entree option we preferred – the beef kabob or the chicken. When placing our order, we were delighted to discover that the kids had many options. The kids were offered chicken tenders or mac n cheese, but also had the option of selecting an adult entree. We made the decision to get two orders of the beef kabob and two orders of the chicken and were pleasantly surprised. My kids – super picky eaters, ate everything without complaint because they loved it. The first course included either salad or soup, the soup being the hands down favorite. As for the main course, they loved the chicken, the beef, the garlic mashed potatoes and the rice. 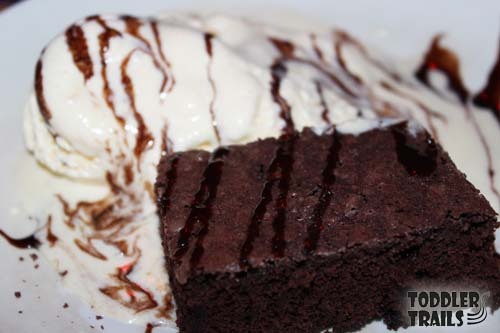 And for dessert – a brownie sundae with chocolate sauce – yummy! We had seen the Pirate Dinner Adventure Winter show where the pirates had kidnapped Santa. That was super fun and entertaining, but we LOVED the summer show. Full of action and adventure, the show never stops. The pirate competitions were fun and engaging as the audience got into the action whether it was assisting your assigned pirate or just cheering them on. 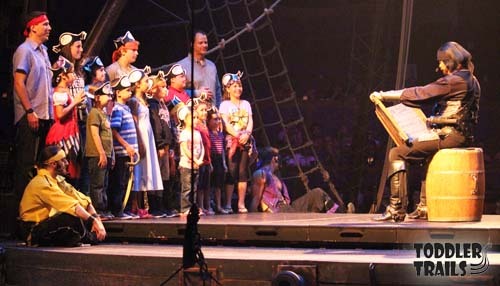 When I asked my kids what their favorite part of the show was, they both responded that really enjoyed being invited onto the ship, playing tricks on the captain and being appointed an authentic pirate. Have you ever seen a baby dragon? We had the pleasure getting up close and personal with this one. 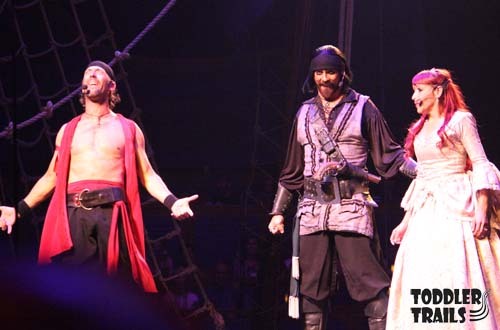 At the end of the show, the pirates invite you to take a picture – with all of them! A few of them stay behind by the ship, and others were in the lobby on your way out, making silly faces and entertaining the crowd even more. 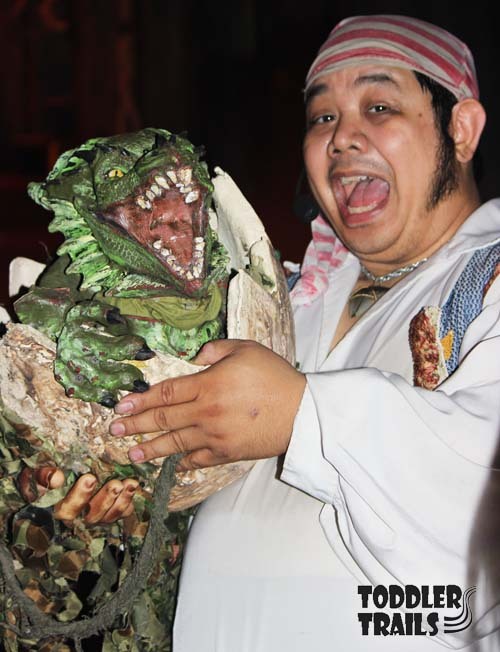 Looking to celebrate a birthday or group event, the Pirates Dinner Adventure is the perfect place. 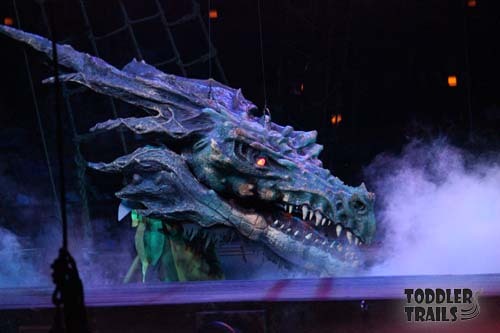 There are special packages where your special person is invited to take photos with the cast on the deck during the show. Wholesale rates are also available. Interested in planning a night with the pirates? 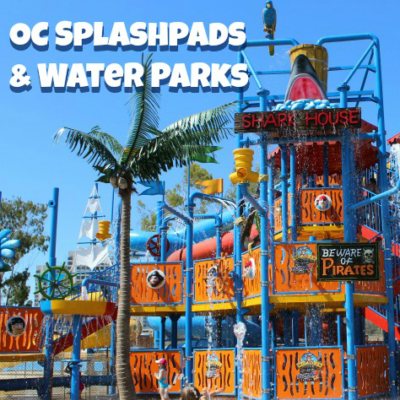 My Readers Save $25 off Adult and $15 off Child admission. 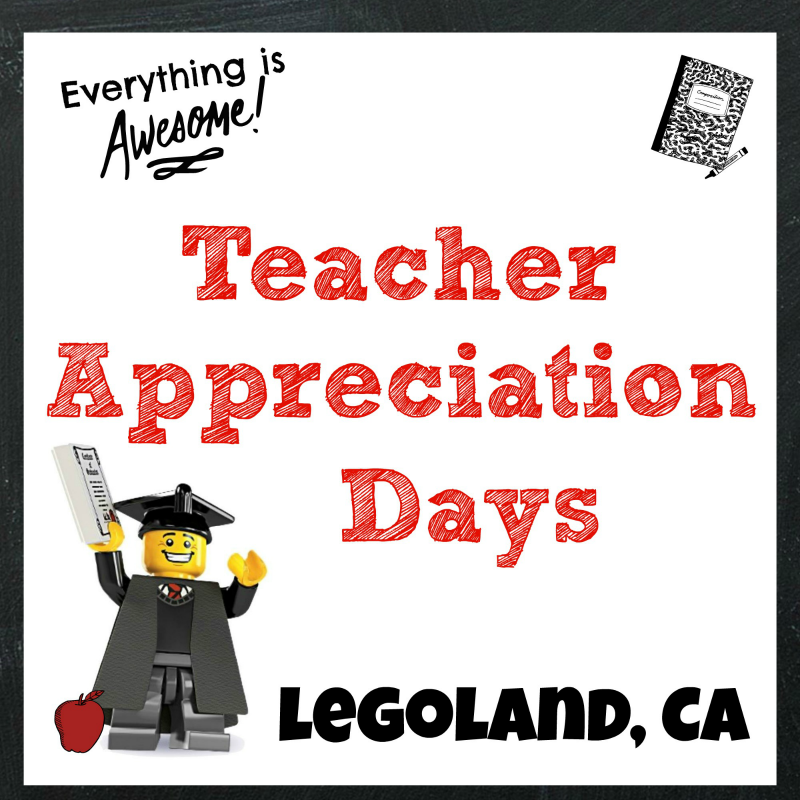 $25 off Adult and $15 off Child admission over the phone and mention code “USFAM” at time of purchase. 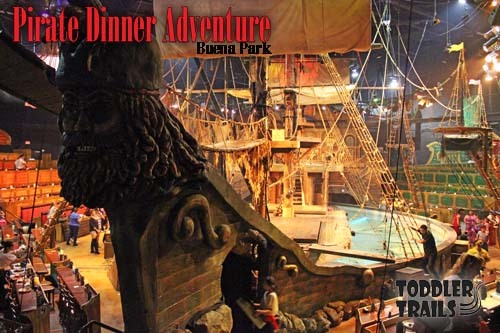 Visit Pirate Dinner Adventure Coupon Reservations required. 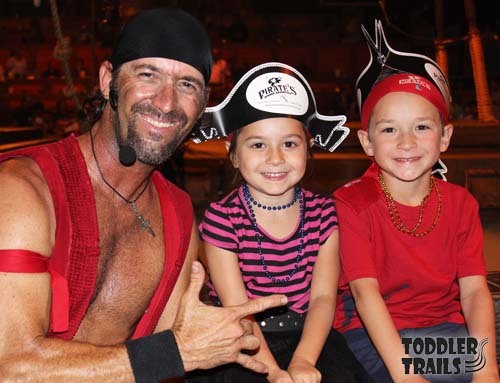 Disclaimer: We received complimentary tickets as a US Family Guide Blogger to the Pirates Dinner Adventure to enjoy the show and share our experience with Toddler Trails fans.